Fuel cells use the chemical energy of hydrogen to generate electricity cleanly and efficiently. Hydrogen fuel cells have the potential to reduce the generation of greenhouse gases, air pollution, and global climate changes, be an important part of energy security, and propel hydrogen technology as the energy supply of the future. The solar panel converts solar energy into electrical energy. This electrical energy is used to split the hydrogen and oxygen molecules apart in the fuel cell through the process of electrolysis. Separated oxygen and hydrogen gases flow back into the fuel cell and are combined together to form water molecules. A byproduct of this process is an electrical current which then powers the motor of the car. Requirements: The FCC can be used in a classroom that has electric outlets and a clear pathway to run the cars - a hallway is ideal. It can also be used outside on a sunny day in an area that has a smooth surface, such as a sidewalk or parking lot. The following directions describe basic demonstration of the Dr FuelCell Model Car using the solar panel. For 7 additional experiments and detailed safety instructions, please refer to the Instruction Manual and Teacher's Guide provided. 1. Fill the fuel cell with distilled water. 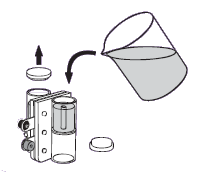 a. Pour DISTILLED WATER into both storage cylinder until the water reaches the tops of the small tubes in the center of the cylinders. b. Tap the reversible fuel cell slightly, to help water flow into the area surrounding the membrane. c. Add more water until it starts to overflow into the tubes in the cylinders. d. Place the stoppers back onto the cylinders. Make sure no air is trapped inside the cylinders. ***If the membrane has not been used in a while, allow to soak for 20 minutes. *** Turn the fuel cell right side up. 2. Plug the red banana jacks of the red patch cord into the red (positive) banana jack terminals of the solar panel and the fuel cell. Repeat with the black patch cord and the negative terminals. 3. Set up the light source at least 20 cm from the solar panel and turn on the light. The fuel cell is now connected to the energy source and will immediately start producing hydrogen and oxygen. 4. When the hydrogen has filled the whole storage cylinder, disconnect the fuel cell from the energy source by unplugging the banana jacks, and turn off the light. 5. Choose a flat, smooth, and unobstructed location. Place the reversible fuel cell into the notches on the model car until it audibly click into place. The terminals should face the front of the car. 6. Connect the red banana jack with the red terminal and the black banana jack with the black terminal - the car will start running. Set the LOAD knob to OPEN. The fuel cell should be filled with distilled water. Connect the solar panel, light source, load measurement box, and reversible fuel cell as shown in the figure. Notice that the red (positive) terminal of the reversible fuel cell is connected with the black (negative) terminal of the ammeter. Set the LOAD knob to SHORT CIRCUIT. Read out the values on the displays. Turn the load measurement box OFF after you have accomplished all your measurements. The fuel cell should be filled with hydrogen. Connect the reversible fuel cell to the load measurement box as shown in Figure (B). Set the LOAD knob to the desired resistance. Turn the load box ON. Read out the values on the display. Figures from Dr FuelCell Model Car Quick Guide by Heliocentris.